The Guardian is embarking on a major series of articles on the climate crisis and how humanity can solve it. In the first, an extract taken from the Introduction to THIS CHANGES EVERYTHING by Naomi Klein, the author argues that if we treat climate change as the crisis it is, we don’t just have the potential to avert disaster but could improve society in the process. Clean Technica: Tesla Model S Named Best Overall Car By Consumer Reports. Again. I'll tell you my favorite sign from the March: two guys, each holding up a ragged piece of cardboard. The first guy's scrawly magic marker message reads "F@#$ Fossil Fuels." The second guy's equally homemade piece sports a big arrow pointing to his friend's sign and says, with a reassuring boldness, "That's the plan." As the gaping hiatus between April and now might suggest, there's getting to be too much climate-related news for us to follow and parse out here. So, going forward, we'll use this page as a blog space for whatever we feel is of urgent significance related to climate change. This could range from the globally significant to the locally important to completely anecdotal personal experience. We welcome comments about our website and show: info@theforecast.org. Robert Jay Lifton, psychiatrist and author, writes: "With both the nuclear and climate threats, the swerve in awareness has had a crucial ethical component. People came to feel that it was deeply wrong, perhaps evil, to engage in nuclear war, and are coming to an awareness that it is deeply wrong, perhaps evil, to destroy our habitat and create a legacy of suffering for our children and grandchildren." In a subsequent conference call discussing Elon Musk's decision to open-source Tesla Motor's patents, Musk made this statement: "I don’t think people quite appreciate the gravity of what is going on [with regard to global warming] or just how much inertia the climate has.” “We really need to do something. It would be shortsighted if we try to hold these things close to our vest.” Musk's decision is nothing short of heroic. And it is not altruistic (as others have said), since Tesla will, in the end, be the overwhelming beneficiary. Elon Musk has simply done the right thing, for himself, for Tesla, and for our world. ...premiers on Showtime at 10pm ET. Wikipedia has more information on this 9-part television documentary featuring prominent celebrities, scientists, and journalists. Maybe it will help a little. The full-length first episode is also available on YouTube. Interesting, the report from IPCC Working Group III: Mitigation of Climate Change, is also set to be released on Sunday in Berlin. Its purpose is to present workable options for limiting global warming to 2°C. Yes, El Niño is a weather event ...accentuated by climate. If it materializes (70% probability), Lindsay Abrams writes: "...it could be enough to make 2014 the hottest year in recorded history, and 2015 could be even warmer than that. The 1997-98 super El Niño was enough to boost global temperatures by nearly a quarter of a degree Celsius. If that scale of warming happens again, the world could approach a 1°C departure from pre-industrial times as early as next year. As climate scientist James Hansen has warned, that’s around the highest that temperatures have ever been since human civilization began." So, year after year, we are looking at unprecedented events—which makes accurate extrapolation into the future very difficult for scientists. As such, it is my considered view that we begin to view climate change as an existential crisis for humans. Of course, it is already this for many, many other species. Lindsay Abrams interviews Russell Gold, a Wall Street Journal reporter whose family in PA was offered $400,000 plus royalties to lease their land for fracking. "Gold contends that it’s unrealistic to stop fracking, but says it’s vital that we slow down and hold the industry accountable — and not let up on them for an instant." I get the distinct impression that this is rationalization par excellence. They also discuss what Gold claims are "myths"—that renewable energy and fossil fuels are an either-or proposition, and that fracking poses a threat to groundwater. Surprisingly, there was little emphasis that the current trajectory of climate change demands an either/or decision, now. Of course, we will ask Ms. Abrams about this when we interview her in June! This is ExxonMobil's promised report to activist shareholders on the financial risks posed to its fossil fuel assets under various climate policy scenarios ranging from little regulation to a "low carbon scenario". Their conclusion? "Based on this analysis, we are confident that none of our hydrocarbon reserves are now or will become “stranded.” We believe producing these assets is essential to meeting growing energy demand worldwide, and in preventing consumers – especially those in the least developed and most vulnerable economies – from themselves becoming stranded in the global pursuit of higher living standards and greater economic opportunity." Sad and sobering to say the least. This is an excellent essay by Michael Klare spelling out the consequences of "addiction" and the self-destructive behavior of addicts. An introduction by Tom Engelhardt summarizes recent bad news about our climate. This is an apt headline for the IPCC report of Working Group II, but I am less than impressed by the relatively sedate language in the IPCC press release. Thre is much ado about climate change being an exercise in "risk management," without suggesting that it is actually an existential crisis for most species on this planet, probably including us. Some background: "The Working Group I report was released in September 2013, and the Working Group III report will be released in April 2014. The IPCC Fifth Assessment Report cycle concludes with the publication of its Synthesis Report in October 2014." Written by a Harvard Law School student. Cornell is hardly alone in failing to lead. As usual, it will be up to ordinary citizens to help their timid leaders to do the right thing. Why do we tolerate this? In response to resolutions from the Student Assembly and Faculty Senate, Cornell University President David Skorton issued this statement on Feb 26, 2014: "I am unwilling to recommend divestment from fossil fuel companies to our chief investment officer or to the Investment Committee of the Board of Trustees." This is not leadership. And yet, I wonder if any students will quit, or faculty will resign, or civil disobedience will ensue from this pronouncement. I'm guessing not. Are we so dependent on powerful institutions (like Cornell) and companies (like ExxonMobil) that we will sacrifice our long term well-being for immediate security? Apparently so. Initiated by the Ceres organization, activist investors have filed shareholder resolutions with several fossil fuel companies asking for an assessment of the risks that stricter limits on carbon emissions would pose to the valuation of the companies' assets. This is a big deal because a large fraction of existing fossil fuel reserves must become "unburnable" in order to avert catastrophic climate scenarios. The author, Michael E. Mann, is the scientist who published the (in)famous "hockey stick" graph of global temperature rise with the IPCC report back in 2001. In this blog post of a recent Scientific American article, Dr. Mann discusses equilibrium climate sensitivity (ECS)—which is how much surface warming ultimately occurs with a doubling of atmospheric CO2 from its pre-industrial level of 280 ppm to 560 ppm. The estimates range from 1.5°C to 4.5°C, with a value of 2.5°C fitting the data best. This means that we will experience a 2°C rise by 2046. If ECS is 3.0°C, then the same 2°C rise will occur by 2036. Of course, 2°C is the well-known tipping point which "Most scientists concur... would harm all sectors of civilization—food, water, health, land, national security, energy and economic prosperity." Dr. Mann hopes that ECS is only 2.5°C: "So even if we accept a lower ECS value, it hardly signals the end of global warming or even a pause. Instead it simply buys us a little bit of time—potentially valuable time—to prevent our planet from crossing the threshold." Basically, the message is that we have only 22 years left to stop carbon emissions entirely without risking an existential catastrophe. So what are your plans for the next 22 years? What about your children? Supposedly a watershed moment... the American Association for the Advancement of Science (AAAS) just released this 18-page report and a charming little video featuring climate experts explaining what the term "scientific consensus" means. The NY Times duly reported on it. Boring. Where's the PASSION people! "This year, it happened even sooner: we crossed 400 ppm on March 12 and again on March 13, a full two months earlier than the first time it happened [in 2013]. When carbon dioxide was last at these levels [somewhere between 800,000 and 15 million years ago], polar ice melted and flooded the oceans, raising levels up to 130 feet higher than today’s levels." Something fun: ClimateRide.org is putting together 3 rides: one in California's wine country in May; and another 2 rides in September — one in the Midwest and one from New York City to Washington DC, Sept 20-24. Riders raise money for a variety of climate change-related charities while enjoying a scenic, fully supported bike tour that is capped off with evening programs and speakers along the way. This sounds to us like a great way to connect with like-minded people, tour a good chunk of the Northeast, learn a thing or two and raise money for a good cause. Gallup: Climate Change Not a Top Worry in U.S.
"Climate change and the quality of the environment rank near the bottom of a list of concerns for Americans, who are instead far more worried about more basic economic issues such as the economy, federal spending, and the affordability of healthcare. Concerns about the environment typically rank low among all Americans, but the current level of worry is even lower than in the past." "It is unclear whether or to what extent the senators' actions Monday will raise Americans' concern about climate change or the environment. But unless Americans' concern increases, the likelihood of the public's support for significant legislative action on environmental matters is small." This is an eloquent essay by Rebecca Solnit about why people don't respond appropriately to the existential crisis which is climate change... and what we might do to change that. This article calls attention to the Defense Department's Quadrennial Defense Review (QDR) — which names climate change 8 times in the 64-page document as a significant factor influencing defense capability. Isn't it remarkable how we all frame our world in different ways? The U.S. Government Accountability Office recently released a 74-page report showing that climate change does threaten our nation’s energy infrastructure, including both traditional fossil-fuel and nuclear sources and renewables. What a surprise! This is why who is president matters... while elected legislators are powerless and largely clueless. THIS IS AWESOME! ...as I compose this on an Apple iMac. This is called LEADERSHIP. ...since record keeping began in 1766. $1.7B in damages. NOAA: This animation of arctic sea ice loss speaks for itself. Watch the oldest (whitest) ice start disappearing quickly from about 2006 onward. Click on the video's info icon for a detailed description. This short article reacquaints us with Svante Arrhenius' 1896 (yes, 1896!) hypothesis of "Arctic amplification" — whereby greenhouse gases warm the Arctic more quickly than the rest of the planet and is "...now able to be seen above the noise of the world’s weather." A couple of very nice video animations of temperature and Arctic ice cover make the phenomenon obvious. A warmer Arctic means less of a temperature gradient between there and here — which causes weakening of the jet stream — which causes it to "wander" or "meander" — which causes it to "block" large scale weather patterns (like cold air masses) — which causes them to persist longer than otherwise — which is why we're freezing for such long periods this winter. This causal chain of events is only a hypothesis, but it's fast gaining support from climate scientists. So... Who's responsible for climate change? Who ultimately pays for its consequences? Do you doubt that your electric bill is going up because of this? This is about weather, not climate. But, weather and climate are linked — see the NY Times article linked here and the Feb 9 news story below. A great image from NASA tells the story of the Polar Vortex. NY Times: Freezing January for Easterners Was Not Felt Round the World. In fact, it was the 4th warmest January on record for the world as a whole. Got Climate? "The new regulations, to be drafted by the Environmental Protection Agency and the Transportation Department by March 2015 and completed a year later so they are in place before Mr. Obama leaves office, are the latest in a series of actions intended to cut back on greenhouse gases without the sort of comprehensive legislation the president failed to push through Congress in his first term." This is a great speech, but doesn't it lose credibility with President Obama's equivocation on Keystone XL? Apart from that, read it (or watch it) and analyze your own rationalizations for why you don't have solar, or aren't driving a Tesla, or—at the very least—aren't taking energy efficiency steps for your home and business that will eliminate the need for (and our embarrassing dependence on) the Cayuga Lake coal power plant. If we are asking Indonesians to do something, is it not a moral imperative that we do the same? So Mr. Kerry, what about Keystone XL? "When 97 percent of scientists agree on anything, we need to listen, and we need to respond. First and foremost, we should not allow a tiny minority of shoddy scientists and science and extreme ideologues to compete with scientific fact. I have to tell you, this is really not a normal kind of difference of opinion between people. Sometimes you can have a reasonable argument and a reasonable disagreement over an opinion you may have. This is not opinion. This is about facts. 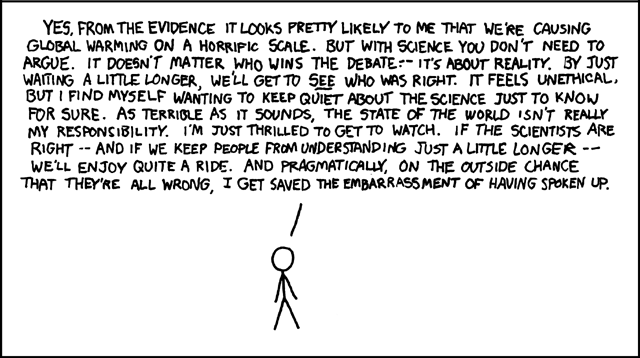 This is about science. The science is unequivocal. And those who refuse to believe it are simply burying their heads in the sand. Finally, if we truly want to prevent the worst consequences of climate change from happening, we do not have time to have a debate about whose responsibility this is. The answer is pretty simple: It’s everyone’s responsibility. And in a sense, climate change can now be considered another weapon of mass destruction, perhaps the world’s most fearsome weapon of mass destruction. ...climate change isn’t only a challenge. It’s not only a burden. It also presents one of the greatest economic opportunities of all time." For people who only skim the paper, headlines like this one mislead. After reading the article, one is left with little doubt that climate change is probably causing—and is certainly worsening—the "exceptional" drought in the southwestern US. Exceptional drought is the worst drought level and is defined as follows: Exceptional or widespread crop/pasture loss. A shortage of water in reservoirs and streams creating a water emergency. Have you noticed how the conversation about climate change is moving from "prevention" to terms like "resiliency"? In this article, Obama proposes a $1B climate resiliency fund—which sounds like a lot—but is actually trivial compared to the enormity of the problem. Compare this to New York's $20B climate resiliency plan. This article references BP's Energy Outlook for 2035 presented in a recent speech by its CEO. What's remarkable is that he actually says that carbon pricing is the only viable means of controlling GHG emissions. An excellent synopsis of weather versus climate and the fallibility of human perception. "Perhaps this is the real reason everyone is panicking about the cold: Winters have become so mild over the past 20 to 30 years that a blast of Arctic air feels extraordinary." 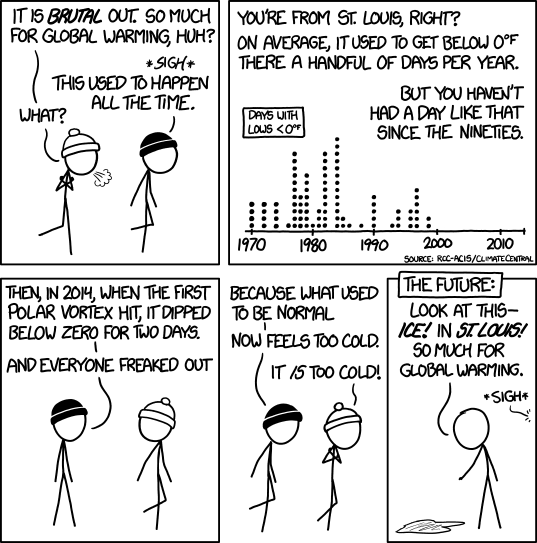 Christian Science Monitor: Winter weirdness: Is Arctic warming to blame? "If the authors succeed in writing a lawsuit-proof regulation that is effective in cutting carbon emissions from America’s 1,500 power plants — the largest source of the nation’s greenhouse gas pollution — the result could be the most significant action taken by the United States to curb climate change." It's all about coal and money. Best quote from the article: "Coke reflects a growing view among American business leaders and mainstream economists who see global warming as a force that contributes to lower gross domestic products, higher food and commodity costs, broken supply chains and increased financial risk. Their position is at striking odds with the longstanding argument, advanced by the coal industry and others, that policies to curb carbon emissions are more economically harmful than the impact of climate change." A Passive House is a very well-insulated, virtually air-tight building that is primarily heated by passive solar gain and by internal gains from people, electrical equipment, etc. Energy losses are minimized. Any remaining heat demand is provided by an extremely small source. With intelligent design, we can be warm and cozy, not contribute to climate change, and admire the wonder of the Polar Vortex. These are links to scientific information about the synthetic chemicals MCHM and PPH—which leaked into the water supply in West Virginia. They are used in the processing of coal, and as such, are yet another very negative way that fossil fuels impact our lives. How do you suppose that goldfish in its bowl would react to a few drops of MCHM and PPH? Is this what we want for our world? Just look at the graph—it tells the story without further comment. Have a look at the very interesting maps showing each country's contribution to the present 0.74°C global temperature rise. The U.S. is responsible for 0.15°C or 22% of the rise. So... are we not proportionately responsible for fixing the problem? ...but only in terms of GDP per the leaked upcoming IPCC report. Is fighting climate change a "just cause"? Is it worth the cost? Does a living, healthy planet have some intrinsic value beyond measure? We often find (links to) scientific articles referenced in popular media. This original source was referenced here. Is this not a great idea, or what? The extreme cold we've just experienced is consistent with a climate pattern known as "warm arctic, cold continents". Proceedings of the National Academy of Sciences: Anthropogenic emissions of methane in the United States ...are greater than we thought. The Sydney Morning Herald: Marine life on the move - describes how local marine species are migrating in response to warming surface waters, according to a source article published in the international science journal Nature Climate Change. A special issue of the preeminent scientific journal Science is devoted to climate change. According to a new report from the Geneva Association (a trade organization for global insurance companies), ocean warming from climate change is rendering areas in the United Kingdom and Florida uninsurable. The Association is publicly warning world governments that they must increase their mitigation and adaptation efforts to protect their populations from the long-term effects of a warming planet. The Secretary General of the Geneva Association noted in a statement that climate change pressures in the near-term are now irreversible and that ocean temperatures will continue to rise for the foreseeable future, rendering many parts of the globe too risky to insure. The giant reinsurer Munich Re provided data to the press showing that the number of weather catastrophes around the world has risen three-fold in the last 30 years. In related news, earlier this month Mayor Bloomberg announced a $20 billion plan to mitigate the effects of rising sea levels in New York City. Funding will be available for building floodwalls and levees and gates as well as installing flood-proofing measures for hospitals. NY Times opinion piece by Anthony R. Ingraffea, Cornell professor of civil and environmental engineering, stating that natural gas is a "Gangplank to a Warm Future".